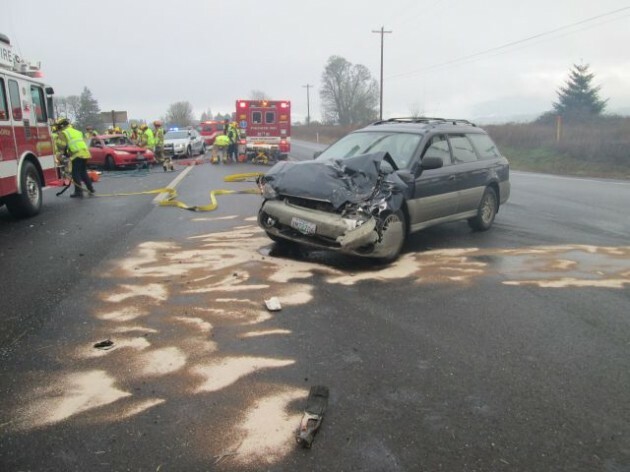 The Oregon State Police took this photo of the Dec. 3 crash site on Highway 20 at Independence Highway. The left-turn collision on Highway 20 at Independence Highway on Tuesday (Dec. 3), in which one driver was cited for running the stop sign on Independence and was seriously injured, reminds everyone that there’s a problem. And ODOT knows it. The state transportation department classifies the Highway 20 intersections at Independence and at Granger Road, three-quarters of a mile to the west, as among its top safety problems. A safety audit to see what might be done about the steady drumbeat of crashes at both sites made recommendations in April 2012. Then, in March 2013, the ODOT traffic engineer for this region issued her response. Her main conclusion: Because of the traffic jams and rear-end collisions that would result on Highway 20, ODOT does not support and will not pursue putting in signals at either intersection. Also out, because of the cost estimated at upwards of $8 million, among other reasons, is a frontage road from one intersection to the other and a roundabout there. What ODOT planned to try instead was restriping. At Independence, it planned to experiment with “two-stage left striping,” whatever that means. It might also install message boards at Independence and Granger. The boards would warn Highway 20 drivers when side-street traffic is waiting. OR! Maybe people could just use safe driving skills? I have turned left on that intersection over 100 times, never came close to an accident. I have had some long waits (almost 4 minutes!!! ), but just waited until is was safe and prudent to turn. On the other hand, I have had a few close calls at the intersection when I was on the HWY 20 side of things. Idiots make left and right turns onto the highway with little regard for the oncoming traffic. Julie Reyes left this reply on Facebook: When I used to commute from Corvallis to Albany daily for work I would see at least one accident a week, more often at the Granger intersection but the Independence intersection had it’s fair share. I don’t think it is that people are running the stop signs, but that they are trying to pull out onto the 20 and don’t judge the oncoming cars’ distance and speed very well. The safety audit was done with safety recommendations being given in April 2012, and the ODOT traffic engineer took over a year to respond? (Actually, not quite a year — ed.) And her conclusion? Traffic will back up and people will start rear ending each other. They are poorly designed, dangerous intersections. People are getting hurt on a regular basis; that should be more important than keeping the traffic speeding down the highway. Traffic lights can and should be timed to alleviate traffic congestion; if traffic is moving too fast for people to safely come to a stop for a traffic light, traffic needs to be slowed down.